One of my biggest expenses are groceries next to utilities. I'm always finding ways to save even a nickel or dime wherever I can, yet live on a decent diet. My goal is to have as much fresh fruit and vegetables in my diet as financially possible. The diet around the house is more grain based, lots of fruit and vegetables, some poultry and the occasional red meat. This means that the coupons that I use are far and few between, so I have to find other ways to save money. I shop at the local King Soopers(Kroger) store and occasionally at Safeway, both of these chain stores have an area in the back of the store where they put reduced items or items that are about to expire, mostly bakery items. These areas aren't as large as I would like, but they are handy if you don't have a salvage store in your area or within decent driving distance. Some other places to look for greatly reduced items are dollar stores and their cousins. There is a Big Lots near me and Dollar General, these stores seem to be best for general merchandise and not food, but yours may be different. 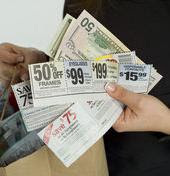 Circulars come in handy with stores that will match prices of other stores. The first thing I did before going forward was to calling around to the stores I frequent and find out if they price match. Price matching doesn't seem to be a chain decision but a store by store decision so calling is best and sometimes calling on different days/hours as you can get different answers if management isn't available or they have multiple managers. Over time I have said to myself, "darn I wish I had grabbed that coupon." Something always seems to come up that I buy something I didn't know I would need. Now I clip coupons that I know I will use and others that I think I MAY use. If I don't use them, that is fine, at least I have them just in case. You can't use two manufacturer coupons on the same item, but you can use a store coupon and a manufacture coupon together. I'm not great in this area, because I rarely find items to use both a store coupon and a manufacturer coupon. But on occasion there will be a Target coupon or Walgreen coupon that I can use with a manufacturer coupon that is an even better deal than a cheaper brand. King Soopers(Kroger) doubles coupons and is the only store in my area that does. Because of this there are many times I will shop at King Soopers instead of Walmart. Even though Walmart may have an item that is 35¢ cheaper, the doubled coupon at King Soopers will save me more money. Every circular I get from King soopers, Safeway, and Albertsons have a few deals that are so good I can't pass them up. Stores do this on purpose to get me in the door in the hopes I will pick up more than I need, so they sell these few items at a loss in the hopes they will make up the cost when I buy other items. These loss leaders are the ones I want to stock up on when I can and if I have coupons to go with them, even better. Many of these loss leaders are staples as well - recently I stocked up and froze 1.77 gallon milk, I also grabbed a few extra boxes of cereal. I love it when sale items are out of stock, ok, I don't love it when they run out, but I enjoy it when I can get a raincheck that allows me an opportunity. When I go to customer service they always ask how many I want and I always tell them a little more than I need, just in case. They usually get the item within 7-10 days so I have time to get additional coupons. Since I can't expect to remember all the prices of the items I buy, I instead use the price on my grocery list and compare it to the shopping receipt, any discrepancies I can go to customer service and speak with them showing them my grocery list to get my refund. At one store I go to they drop the meat prices down around 6am each day to sell off the meat that expires in a day or two. Another store brings fresh bread in around 5am, so it is handy to pick up bread and necessary meat on the way home from work. - Eat before I go shopping - this drastically cuts down on junkfood shopping. - Shop the outside ring of the store first and go to produce last - tired of bruised fruit. - Keep up with coupons on the web -this allows me to buy multiples of a product. I have signed up with manufacturers, like Pillsbury and Kraft foods as well as used the links below. Really great article with some great tips. You might want to have a look at my article "Half a Dozen Ways to Cut Shopping Costs" which gives you further tips on how to save money on your shopping bills. Keep up the good work on this blog, going to add you to my Google Reader. Thanks for your link to cutting down costs, looking up and down is one I forgot but do as well. You can also save by planning your meals, buying in bulk and taking food instead of eating out. These are sensible and not revolutionary but life leads people to forget about the basics. We also buy the older bananas that are marked down and make banana bread. It does take more time but it is insurance for our food budget. You can also peel and freeze bananas in small batches. Then you will always have bananas on hand to make smooties, milk shakes, ice cream, to add to hot oatmeal, pancakes, breads, enhance beans, etc. I started an online Price Book using Google Docs that I have shared with my blog readers, to compare grocery store prices across the city. A few others have contributed, but I also use it all the time myself. I can see what is cheaper at which stores, and stock up on the cheaper items wherever I shop. Even if you just use it personally, a price book is a great idea, and online tools make it much easier than the old paper-and-pencil methods. Nice, practical tips you have here. I also want to add what I've been telling my friends: do not do grocery shopping on an empty stomach. Funny but true. Everything just looks inviting when you are hungry! Don't know if this has been mentioned but I have found it helpful to sign up for all store "bonus" cards at just about every possible grocery and drug store chain and carry them with my keys. That way if it is a store I rarely go to and see a sale with "bonus card" I am prepared. I've seen some of the nicer cashiers swipe the card they keep at the register if you ask, depends on the store. But signing up is super quick and easy.